BC Lions today announced that international defensive back Marcell Young has signed with the team. 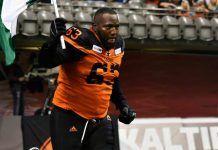 Most recently a member of the Edmonton Eskimos, Young (6’0”, 190) is a seven-year CFL veteran who began his career with the Hamilton Tiger-Cats in 2011. After two years out east including 23 regular season appearances and 63 defensive stops, he signed as a free agent with the Green and Gold in 2013. 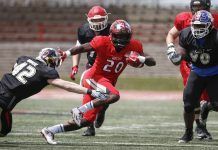 Over a five-year span with Edmonton, the Jackson State grad appeared in 74 regular season games notching 199 defensive tackles, four special teams tackles and three interceptions. Young also earned a Grey Cup win with Eskimos in 2015.